AT&T’s chief executive Randall Stephenson is on the record stating that it was a huge mistake for the company to have offered its customers an unlimited data plan in the past. But not all major carriers agree with that assessment: Just this week, Sprint has introduced its new Unlimited Guarantee plan that locks in its all-you-can-eat data offering for life. According to the details of the new plan, Sprint Unlimited Guarantee customers will pay $30 per month on smartphones and $10 per month on standard phones for the privilege of unlimited data. When combined with a voice and text plan, you’ll pay about $80 per month (before taxes and fees) for the first phone line, and $10 less for each additional line after that. Prices may increase for the plan in the future. Verizon and AT&T once made the offer of unlimited data to their customers primarily to lure in new iPhone buyers when the device launched on their networks. But both have since changed their policies. AT&T allows customers to keep their grandfathered unlimited data plans, but those who use more than 5GB of data in a month will find their Internet speeds drastically reduced. Verizon requires customers to buy phones at full retail price to keep their grandfathered unlimited data plan – something the company knows most people won’t actually do. Given the kind of bait and switch carriers have played over unlimited data plans in the past, can you really trust Sprint’s guarantee? The truth is that the company is in a distant third place in terms of subscribers – its real competition isn't AT&T or Verizon but fourth place T-Mobile, a carrier that's no stranger to bold marketing moves. Sprint knows that it needs to do something dramatic to lure customers into its stores. Unlimited data is one of the best ways to do that, especially considering that the Sprint network isn’t exactly a high-traffic one. So yes, ladies and gentlemen, the Sprint Unlimited Guarantee is for real. Or, at least, it’s as for real as the Verizon and AT&T offers were. 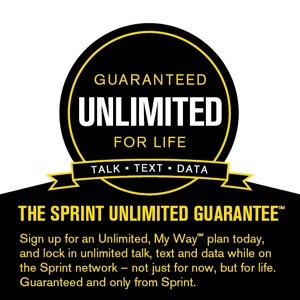 For more details on the Sprint Unlimited Guarantee, visit the Sprint website. I had been a long time user of Verizon while I was in field sales. Verizon was quite good, but I didn’t notice any change when I switched to Sprint when I had to buy my own phone seven years ago. My entire extended family uses Sprint and we’ve been very impressed with access, speed and their policies. And their customer service has gone from being okay to absolutely excellent in the past couple of years. I am always puzzled when I read that they are in 3rd place—but perhaps I should hope it stays that way. They definitely seem to be doing the right things to keep me as a customer.